It all starts with marketing your business on Facebook by starting an effective social media campaign, but is that enough? You also need to measure the success of your campaign by using various tools available online in order to accurately judge the return on investment. These are a suite of tools which helps a Facebook page owner to view the demographics, page visits,conversions and other metrics related to a Facebook page. You need to understand how your page behaves and performs with your audience. This is essential in order to get the most from your campaign. Facebook offers you free analytics once you fan base reaches 30. These are a great way to judge how users are interacting with your content and allow you to take informed decisions based on that data. This section allows you to see the number of posts you shared on your page, the number of people who commented on your shared posts and the number of people who liked your post. This section gives you an overview of the user engagement of your Facebook page. This sections shows you data regarding the number of liked that your Facebook page receives. The data displays likes from particular countries, cities and languages and also displays a graph corresponding to the data. If you wish to see the demographics of your Facebook campaign as to how many people are visitng your page from how many countries, the gender of the people, the age group, the language etc, then this tab would display you all. Talking about this allow you to see more minute details regarding how your content is behaving with the audience. 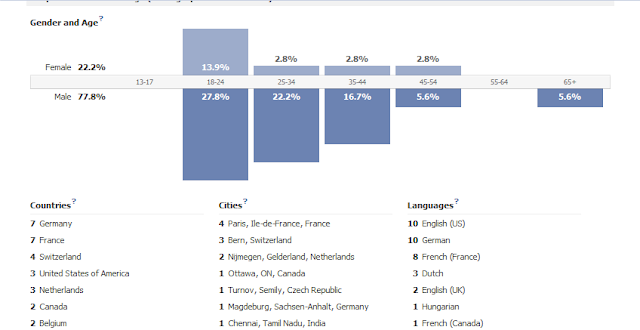 It shows you detailed chart of the number of people according to demographics and location who are commenting and sharing your page. In this way you are able to track the success of your social media campaign using Facebook insights.